We hear about it often these days — community food pantries in dire need of donations, due to increasing demand. In these United States, we have way too many hungry people — including an alarming number of children. That’s why I’m starting an occasional series on my blog: Gardeners Feed the Hungry. 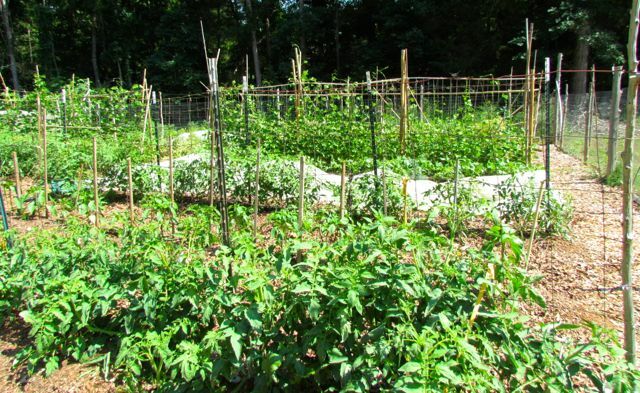 I’m hoping to feature gardeners across the southeastern Piedmont who are using their green thumbs to help fill hungry stomachs with fresh produce. The gardener walking through that immense (60′ x 60′), well-ordered garden in the photo above is Carol Newnam, the driving force behind a community garden about a mile from my home. Most of one half of the garden. Carol was kind enough to allow me to visit this garden today and ask her about this project. Like me, she’s been gardening for decades, but when her husband passed away, she found herself with a garden too large to manage by herself. She was already a volunteer at our county’s food pantry: Chatham Outreach Alliance (CORA). She noticed that although CORA received generous donations of slightly too old produce from local grocery stores and donations from local farms and a community garden, there was never as much fresh produce as there was demand for it. 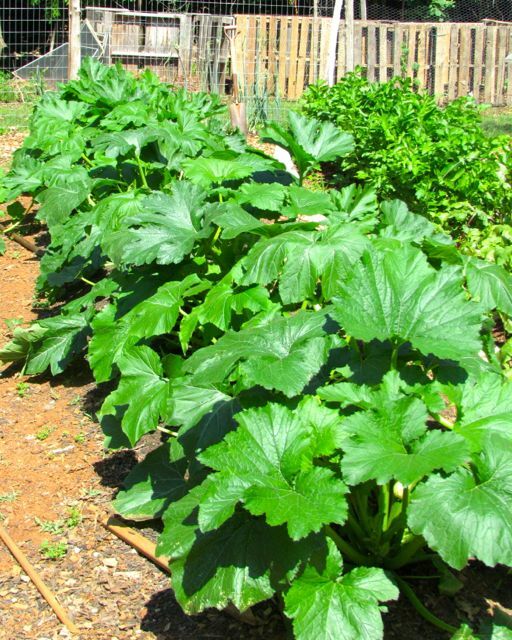 That’s why last year, Carol decided to dedicate half of her immense garden to growing food for CORA. Thus the Friends of CORA Garden was born. Last year was the first year for this project; they donated over 800 pounds of fresh produce to the food pantry. That’s a lot of nutritious food for those in our community who may not have the funds to pay for many fresh vegetables. Carol even grows flowers she donates to the pantry, because she believes everyone should be able to brighten their homes with a little beauty — beauty they couldn’t afford on their own. Carol’s garden is part of her five-acre spread, which is forested everywhere except where she’s growing food. 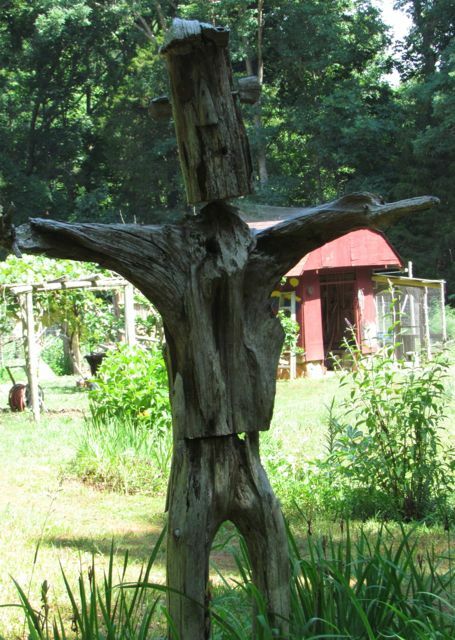 She has fruit trees, an asparagus patch, grape arbors, giant blueberry bushes loaded with green fruit, patches of mint and other herbs and flowers — even a few chickens. 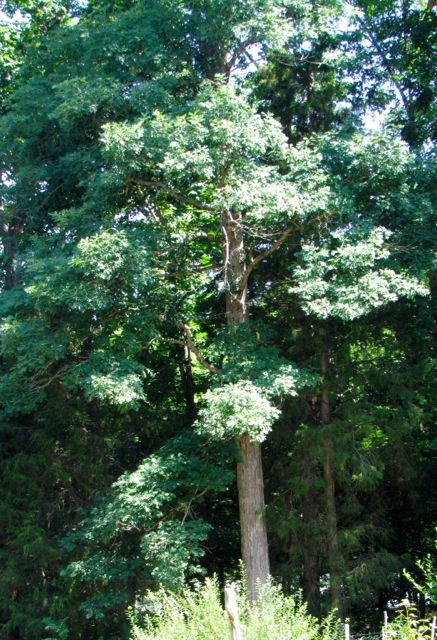 I noticed that the dominant trees on her land are beautiful white oaks, which grow on hilltops in the Piedmont. As is usually the case, such land is rocky; I noticed large boulders on the edges of the cleared garden area. And Carol mentioned that when new areas are dug, rocks are always encountered. Beautiful white oaks surround the garden space. 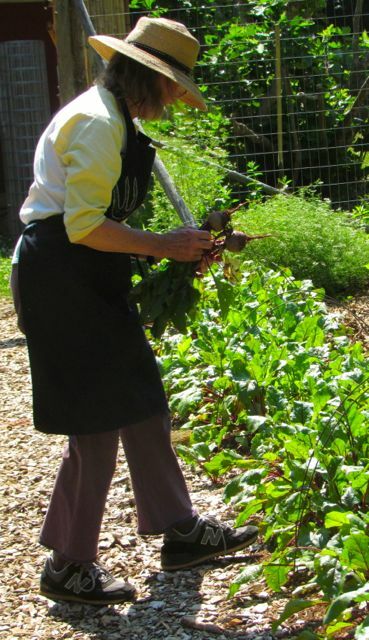 Carol has been adding organic material — mostly leaves — to the garden beds for years, resulting in rich soil that clearly makes veggies very happy. This season, she’s growing lettuce (almost done now), beets, parsnips, tomatoes, peppers, pole beans, field peas, crowder peas, summer straight-neck squash, zucchini, winter squash, cucumbers, pumpkins, onions, garlic, okra, and gourds. 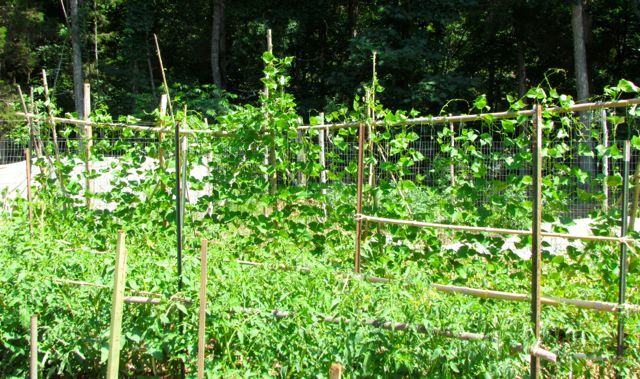 Use of space is maximized by even growing vines on the fence that protects the garden from marauding deer. This year, they trained cucumbers onto the perimeter fence, only to discover that the deer were nibbling as much as they could from the outside. But Carol and her volunteers devised a clever solution. 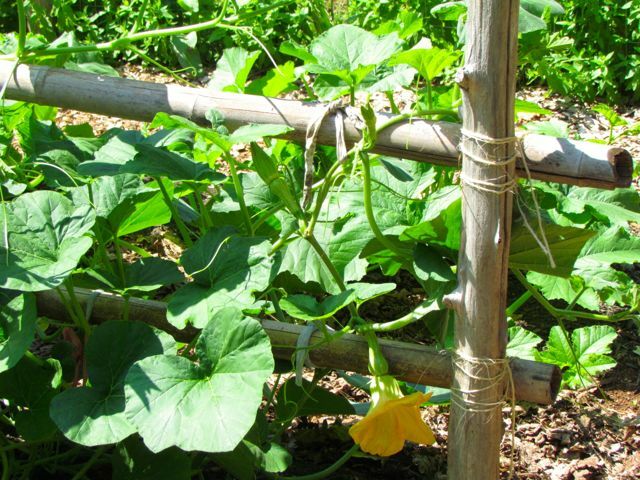 Attaching spun garden cloth to the outside of the perimeter fence prevented deer from nibbling on the cucumbers. Carol is a Master Gardener, which means she has gone through training provided by the NC Agricultural Extension Service. 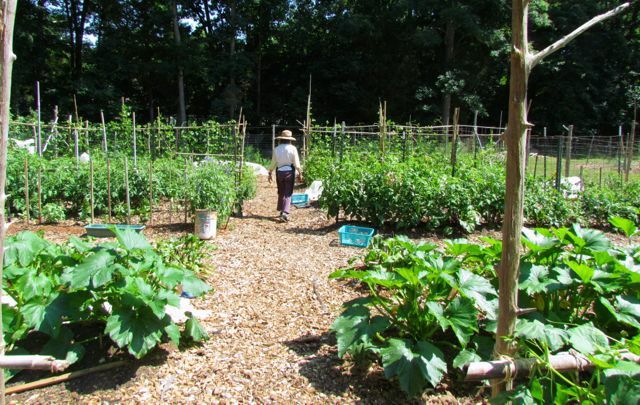 Her garden is not entirely organic, but the pesticides she uses are the least toxic options, and used only when hand-picking of problem insects is not sufficient. Half-runner pole beans and assorted tomatoes. Although you only see Carol in these photos, she was not alone when I visited. Two loyal volunteers were also there, inspecting squashes for squash bug eggs, weeding, and harvesting. Carol tells me she also has had the help of high school students fulfilling community service graduation requirements, and some of her fellow master gardeners also help out. I asked Carol what had surprised her most about this project. She replied that she’s been delighted by the reliable, loyal volunteers who keep returning week after week to help her fill the food pantry’s shelves — although, she says, she could use a few more helpers. Carol relies on proceeds from an annual plant sale and generous donations from the community to get the seeds and plants she needs for the garden. A local business gives her old seeds dated for the previous year. 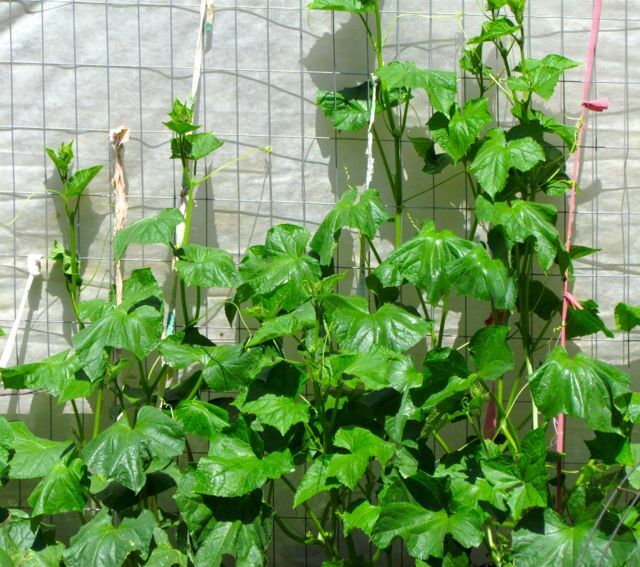 For most vegetables, year-old seed is still quite viable. You won’t get 100% germination, but you get enough to fill a garden — and the price is right. 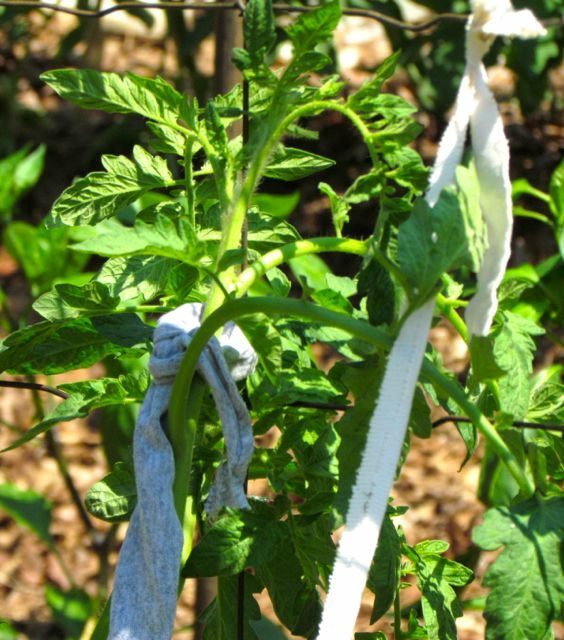 Carol’s tomato ties are pieces of cut-up fabric from old clothes. Community gardens such as the Friends of CORA Garden provide much-needed vegetables to food pantries, which in turn contribute to wider nutrition options for the hungry. 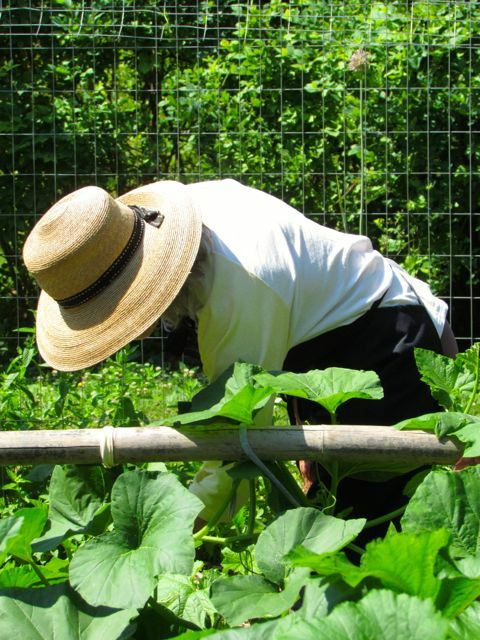 They also provide opportunities for gardeners — some perhaps retired from maintaining their own gardens, but who still get the itch to dig in rich earth, to feel the sense of accomplishment from harvesting a well-formed zucchini, a fat purple beet, or a red, juicy tomato, knowing that a hungry soul will appreciate their efforts. That’s the other thing that surprised Carol after she began this project — how often folks thank her — folks at CORA, and some of the hungry souls who rely on the food pantry to nourish their families. That appreciation helps fuel her resolve to keep the garden going. Carol not only oversees this impressive garden, she also writes a blog about it. If you’d like to help/volunteer at this garden, visit Friends of CORA Garden. Contact information can be found on the About the Garden link on her blog. If you are involved with a community garden that is feeding the hungry in your community, I’d love to hear from you. Please e-mail me at the address listed on the About page of my blog if you’d like me to feature your group’s efforts. All gardeners who grow food know the satisfaction of feeding their families fresh, nutritious vegetables and fruits. Most of us have extras of something from time to time during the season. If you haven’t done so already, please make a call to your local food bank and ask them if they will accept donations from home gardeners. If the pantries have the facilities for storing fresh produce, they will almost certainly welcome any food donations you can offer. Given the rising numbers of hungry souls in this country, I encourage all my gardening brethren to share their bounty. Let’s all do our best to feed the hungry.